The Author & Illustrator Sabine Hahn, born in 1972, is half German and half French. She first completed her training as an artisan bookbinder before studying art education and French. Her great passion for books and for hockey resulted in the creation of the childrenâ&#x20AC;&#x2122;s book series The Hockey-Kids, also illustrated by the author, in collaboration with Chris Faust. Since her first publication in 2014, she has been on the road to readings in sports clubs and schools in her aim to bring children closer to this wonderful sport. 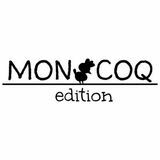 With the establishment of her own publishing company MON COQ edition in 2016, The Hockey-Kids and their author have created a new home, and this English translation marks the start of their exciting journey to children around the world. The Pro Chris(topher) Faust, born in 1968, is an FIH elite coach, certified coach, long-standing Bundesliga, state and national team coach from Frankfurt am Main, Germany. His great commitment to coaching children and to school hockey soon brought the pro and the author together. This resulted in the original idea for a long-overdue joint project with Sabine Hahn - the childrenâ&#x20AC;&#x2122;s book series The Hockey-Kids - for which he provides her with advice and support. More about Chris Faust at www.coachchris.de and at www.hockeykiosk.de. nitely not going to the football project. Anyone can do that!” “Cool!” they suddenly hear excited voices from the crowd behind them. “There’s an ice rink at the school! That’s what I want to do! I’m going to join the ice hockey project!” Surprised, Lars, Max and Lena turn back to the noticeboard. “Ice hockey? Where did you see that? 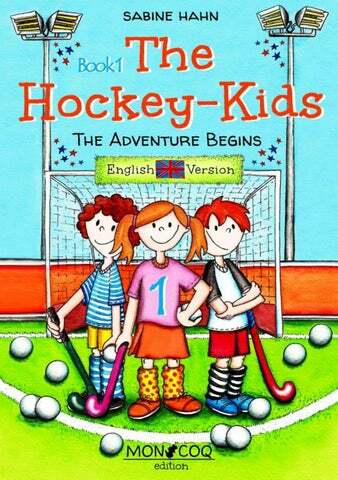 Team handball, soccer, rope skipping… ah, here it is, hockey.” Lena rolls her eyes. “That’s not ice hockey, it’s field hockey! Not on ice, on artificial grass!” she explains to the others. “That’s brill”, she says, “that’s what we’ll sign up for!” Lars and Max look at each other a bit doubtfully. Hockey? That’s only for girls. Like in the film they saw at the cinema where all the girls had short skirts on and pink plastic gum shields in their mouths. “You’re joking! That’s nothing for us”, they both exclaim at once, “you can do that on your own!” “Hockey?” mocks Tom, “what nonsense!” Then the school bell rings and break is over. At last! The pedestrian lights switch to green and the three friends cross the road. “I still think hockey would be great”, Lena tries to convince Lars and Max. “It’s definitely not just for girls! Only last year I watched hockey on TV and there were lots of big men playing for medals. I think it was the world cup or Olympics or something like that. Anyway, my Dad thought it was great!” Proud of her knowledge of sports, Lena decides that it would be better not to mention that she saw the last girls’ film at the cinema three times. Since then, she hasn’t been able to get hockey off her mind. But Max and Lars actually don’t seem to find the idea so awful any more. “You know what,” Lars murmurs to his friend, “perhaps the idea isn’t so bad after all. We’ll let that silly show-off Tom go to the soccer project. Then we’ll be rid of him and can also see what hockey is like.” Turning to Lena, he says: “But if it does turn out to be a girly thing, then we boys will choose the next project and you’ll have to join in too!” Lena is thrilled. “That’s ace! It’s a deal!” she laughs. Hockey was and still is my life and I am sure that you will feel exactly the same! Go, go, go and enjoy your life full of hockey!